May 1, 2017 – This week, our time machine touches down at the height of the Red Scare, in the Oval Office of President Dwight D. Eisenhower, whose public stance of ignoring Senator Joseph McCarthy’s descent into demagoguery — refusing even to mention his name — has long been cited by historians as proof that the old World War Two general just didn’t care. Some even dared call the former Supreme Allied commander, a coward. After his death, Ike’s strategy would be revealed and dubbed “the hidden hand.” He felt that to attack McCarthy straight-on would raise his statue within the Republican party and the nation, and ultimately be counterproductive. 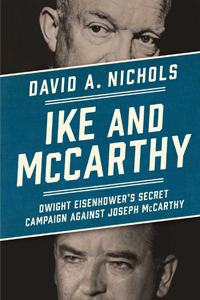 The book that sets the record straight is Ike and McCarthy: Dwight Eisenhower’s Secret Campaign against Joseph McCarthy , by David A. Nichols, a leading expert on the Eisenhower presidency. You can dig into our guest’s other works and thoughts on history, on Twitter @DavidANichols8.